High-volume cleaning areas need a cleaning wipe that is up to the task. Whether your need is for a busy emergency room in a hospital or for your painting business, a versatile, durable wiper should always be handy. That is what you get with TIDDOX’s CLASSIC JUMBO ROLL of industrial wipes. Soft enough for use on the skin of a patient, but tough enough to clean machinery, these cleaning cloths will do whatever job you want. TIDDOX has priced these wipes to make them one of the most affordable cleaning rags on the market. And, they are disposable! They rest neatly on the TIDDOX JUMBO ROLL FLOOR DISPENSER, making the 300 meter-long roll of perforated cloths handy for everyone in your department. There are 600 perforated towels on each roll. Having larger rolls means you order supplies less often and pay less shipping. These are low-lint towels, so many of our customers use them to polish delicate machinery, lenses, and mirrors. Try the CLASSIC JUMBO ROLL for your automotive garage. The fibers soak up oil, antifreeze, battery acid and will grip viscous liquids such as oil, grease, and gels. Very durable when soaked in solvents, too. More convenient and cost effective than a bag of rags, and easier to transport and store this 600 wiper roll, which is the same size as a 10kg bag of rags! Your car wash won’t need any other car washing cloth. The CLASSIC JUMBO ROLL will get you through the busy post-rainy days, and customers won’t complain about streaked windows or dried water spots. These tough yet soft cloths will provide great valet service as your employees scrub solvents on dried tar or polish the side mirrors. One of the problems in a manufacturing setting is finding a tough cleaning rag that is also absorbent. Tear a towel off of the CLASSIC JUMBO ROLL to shine a lens or mirror on a finely-tuned tool. There is less dripping on the way to the trash can, too, which eliminates the likelihood of someone stepping in a puddle and tracking it all over the floor. The hospitality industry is always looking for an affordable disposable towel. With the Jumbo Roll, you get plenty of both! This disposable towel goes from shining glasses at the bar to cleaning hotel rooms. TIDDOX’s CLASSIC JUMBO ROLL provides you with 600 tough, absorbent cleaning cloths that can be used to scrub up difficult stains. Add Tiddox to your janitorial supplies today! Emergency Departments, Hospitals, and medical staff rely on TIDDOX's multipurpose CLASSIC JUMBO ROLL of medical wipes for tasks ranging from soaking up blood, urine, and feces to general purpose cleaning applications. They are soft enough to use to clean off a patient, but tough enough to clean up dried fluids. Plus, they are a hygienic answer as can be tossed in the trash can when you are done! Daycares and nursing homes go through bundle after bundle of cotton cloths every week. But your work is not done, because they have to be laundered! For less money, why don’t you try TIDDOX's CLASSIC JUMBO ROLL? You get 600 healthcare cloths per roll, and they can be used for everything. They are soft enough to use as a washcloth, but tough enough to clean stubborn messes. Then, throw them away! Printers often have a tough time finding a rag as tough as their job. TIDDOX's CLASSIC JUMBO ROLL will absorb solvents and keep its shape when scrubbing machinery. Use it to clean off ink, gels, and more. A professional painter needs rags that can clean up a drip on the floor or soak up a 5-gallon bucket of spilled paint. The CLASSIC JUMBO ROLL is up to the task. 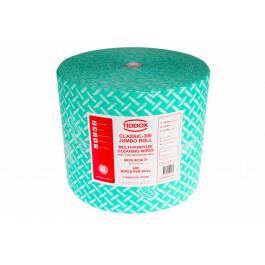 Try TIDDOX’s CLASSIC JUMBO ROLL for your cleaning needs. Regardless of the industry, this towel will be your favorite! Other related products from TIDDOX 's range of cleaning cloths include the CLASSIC CLEANING CLOTHS , the CLASSIC WIPES ON A ROLL, and the JUMBO ROLL FLOOR DISPENSER.